The Nature In Us: Don't Kill This Bug! A couple of years ago I discovered these bugs all over some aphids on the Honey Locust tree. As usual I had to know what they were to know if they were good bugs or bad. I am always hoping for more good bugs in our habitat. I found out they were the larvae stage of the ladybug. 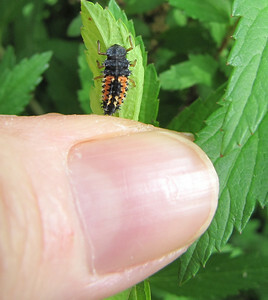 This year I am seeing them everywhere and particularly on the plants that have aphids. 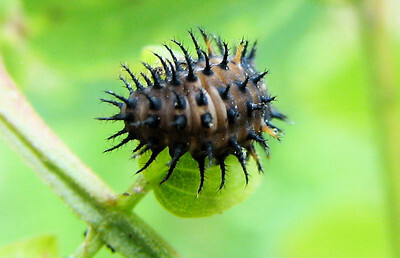 The larvae stage of the ladybug actually eats more than the adult beetle. We've left the aphids alone on a variety of bushes (spireas) and trees and perennials (black-eyed). Seems they attract more ladybugs so it all works out. The plants don't look affected at all. This year I took another picture that isn't so close-up so you can get an idea of the size (in comparison to my thumb nail) and what they look like. Most folks would think it's "just a bug" and not know it's a good thing to have around. Far too many would run for the chemicals and then talk about ordering ladybugs for their garden. The orange pattern can vary a bit on the back and they're pretty small but very distinctive since they're different than anything else I've seen. Be sure to share this information with other gardening friends, especially those who love birds or have pets and children in the yard. There's far too much research now on the damaging effects of these products applied much too profusely to our homes and yards. 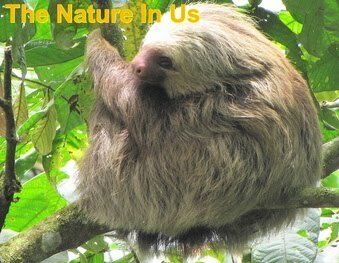 We all need to learn more about the beneficial things we can do to coexist with the natural world around us. Thanks for helping me get the word out to others. Get more ladybug information.